RAWIllumination.net: Natural Law -- notes on the "main characters"
I just finished reading Robert Anton Wilson's Natural Law, or Don't Put a Rubber on Your Willy, and I thought it might be useful to say something about some of the people mentioned in the essay. Samuel Konkin was the publisher of New Libertarian Notes and New Libertarian Weekly and published not a few articles by Robert Anton Wilson and also published this interview with Wilson, one of my favorites. According to this entry on Wikipedia (libertarians appear to be very active on Wikipedia) Konkin dressed in black, refused to vote, opposed involvement in the Libertarian Party, saw libertarianism as a movement of the left and was a proponent of agorism. He died on Feb. 23, 2004. See my interview with Agorist Kevin MacArdry if you want an example of a current proponent. Murray Rothbard (1926-1995) was a very influential libertarian who espoused "anarcho-capitalism." His book For a New Liberty was very popular and influential (I dutifully read it in the 1970s after I discovered libertarianism) and he remains influential, particularly among the Antiwar.com and Lew Rockwell types. His portrayal in Natural Law is not flattering, but I'll note that he was a vigorous proponent of peace. 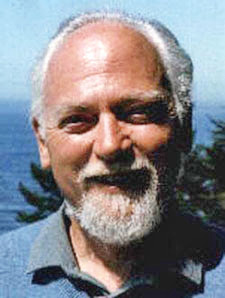 George H. Smith is an American libertarian and atheist. Confusingly for a libertarian science fiction fan, he is not the same person as SF author George H. Smith, or SF author George O. Smith. Arthur Hlavaty also is mentioned in the text, e.g. "Although I do not agree with the almost Manichean attitude of critic Arthur Hlavaty, who regards nature as a combination of slaughterhouse and madhouse against which, by great eﬀort, a few human beings have created a few enclaves of reason and decency, I do agree with, e.g., Nietzsche, Lao-Tse and the authors of the Upanishads, all of whom held that nature or existence combines so many diverse elements that we cannot judge or measure or compare it with anything, and cannot describe it as a whole except in contradictions." Hlavaty is this guy. Yeah, that's me, all right. Back in the 80s Sam Konkin used to warn that the "Kochtopus" was a menace to libertarianism.